By most measures, including PISA results, New Zealand does a very good job of educating its citizens. But what the test results don’t show is that not every New Zealander has had the same opportunities to succeed, and that the indigenous Maori students have had a particularly tough time. High school principal Peter Tootell is working to change that. Tootell’s Trident High School has a large Maori population, and those students have often disengaged from the formal education system. The solution? Trident High School has been instramental in establishing one of the first New Zealand Trades Academies led by a secondary school. Today, Tootell shares more details on the program (including some impressive results), along with his philosophy on creating a strong school culture. 2. High quality pastoral care and support for students and staff. 3. High quality teaching and learning through effective pedagogies. 4. High quality academic programs. 5. High quality infrastructure and resources. 6. High quality co-curricular opportunities. Our school enrollment has increased from 600 to 1200 over the past ten years – a reflection that, according to our community, we are doing the right things and doing them well. Our students are high achievers in academic, sporting and cultural pursuits…the best in this region of New Zealand. Develop a school culture that has pastoral care – the well-being of the students – as the basis for success. Positive relationships and high expectations are the key. Systems and practices, focusing on student learning and success, that are embedded school-wide through a collaborative professional learning community can only enhance what schools are doing. It is not about a focus on “change”; it is not about waiting for a panacea from the outside! It is about continual self-review to enhance what we do in schools, using the research and the knowledge and skills of the practitioners within your school to focus on student learning and make a difference. By encouraging teachers and students to embrace new technologies to enhance learning we have seen greater engagement of students. For example, the development of online learning through video conferencing with a cluster of 12 secondary schools known as The Volcanics. There is a direct collaboration with these schools and there is the opportunity for learning and teaching nationwide and globally. The program allows students to study in curriculum areas not offered by the school. We also provide teachers for the program, currently in Japanese and Digital Photography. We’ve also created the school’s “My Waka” site which is a Moodle-based site accessible by staff, students and parents and contains a wealth of information ranging from learning programs to attendance. And we’ve developed the web-based “My Portfolio” which gives teachers and students an individual learning site, further personalizing learning. “New Zealand’s overall strong performance in PISA masks three important problems. First, wide disparities in student achievement exist between ethnic groups. Māori and Pacific peoples’ average PISA scores are much lower than the average for Pakeha/European students. The gap has not been narrowing fast enough over the years for Māori and not at all for Pacific peoples. Over the seven years from 2004 to 2010, Māori and Pacific candidates for NCEA (a national examination) at all three levels and for university entrance were consistently less successful than European candidates. For example in 2010, 61% of Māori candidates gained NCEA Level 3 compared to 79% for NZ European candidates. backgrounds. In Education at a Glance 2011, New Zealand is shown to have the greatest difference in reading performance between students from different socio-economic backgrounds out of all OECD countries. Although the relationship between students’ background and school performance is evident in all countries, New Zealand is the least successful at mitigating the effect a student’s background has. education as long as their OECD peers. In the Māori Education Strategy Ka Hikitia, the Ministry of Education recognizes that more of New Zealand’s 14 to 18 year old students have disengaged from the education system than in many comparable countries.” The New Zealand Institute – NZ Ahead. What is your school doing right to support education? Maori are achieving as well as NZ Europeans. In 2011 our two top students were of mixed ethnicity but both identify themselves as Maori. Trident High School has been innovative in establishing one of the first New Zealand Trades Academies led by a secondary school. Working in partnership with tertiary provider, Waiariki Institute of Technology, students are able to undertake work-related training while still studying at school. Students can attain tertiary qualifications in fields ranging from construction to business administration to automotive to forestry; nine “trades” are currently offered. Trident invited the seven other secondary schools in the region to be partners and in 2012 this has grown to 10 with schools further away seeing the benefits for their students and requesting involvement. Now over 200 students attend. Our Trades Academy has over 75 percent Maori, by far the largest proportion of any Trades Academy in New Zealand. The engagement and academic success of many of the students in the Trades Academy is a significant feature. Students are gaining NCEA credits together with a tertiary qualification and becoming very employable. The impact on the communities the students come from is significant, especially in the remote rural and predominantly Maori communities (some travel three hours each way by bus to attend). The Academy is providing opportunities for many students in schools where the resources are limited and for some it is helping to break the cycle of generations of under-qualified and hence, under-employed or unemployed. Trident was recognized in a local awards ceremony, winning the trophy for community contribution. Right here, right now! With this generation of “digital natives” education can be more real, rich and relevant; we have the opportunity to embed life-long learning. Be a learner. Understand effective pedagogies and then cater to the needs of individual students. Build positive relationships with your students and encourage them to see the value of education. Have high expectations of every one of them; no deficit theorizing! Helping: There is a greater focus on “learning” as opposed to merely “teaching.” There is a focus on meeting the needs of each student as a learner and the importance of engagement in the learning process. There is a realization that one size does not fit all. The importance of data to inform teaching and learning. Hindering: The attitude of “I taught it; they just didn’t learn it!” Deficit theorizing. The best educational tool in the world is a quality teacher; this is one who cares, believes, understands, smiles, has high expectations, supports, encourages, challenges, inspires and who celebrates every success of every learner in his/her care. Why? Because everyone deserves one. Favorite childhood memory: Playing rugby. Next travel destination (work or pleasure): Prague – The Microsoft Partners In Learning Global Forum. I have recently returned from a sabbatical that covered New Orleans, Boston, New York, Toronto (Canada), Cornwall (England) and Italy. When was the last time you laughed? Why? Reading jokes that are put up in the men’s bathroom at school – humor is good for teachers and even though they are in the bathroom they are “good clean fun”! Kia Manawa Nui. – Have courage to be the best you can be. Microsoft Partners in Learning celebrates the world’s most innovative educators and school leaders for bringing technology to life in the classroom and impacting millions of students. 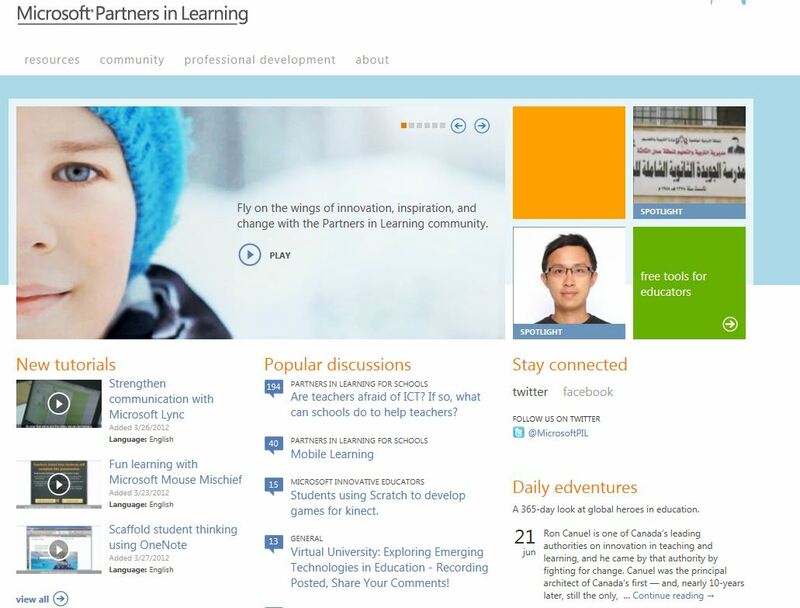 Join the online Global Forum Community now and connect with the finalists on the Partners in Learning Network! ​Microsoft Partners in Learning hosts national and regional events throughout the year that recognize innovative educators and school leaders. These competitions culminate in the Partners in Learning Global Forum. This year’s Global Forum will take place in Prague, Czech Republic from November 28 – December 1, 2012. The Global Forum – with the theme, “Your ideas matter” – will bring together more than 500 of the most innovative teachers, school leaders, education leaders, and government officials from 75 countries. This entry was posted in Leadership and Strategic Innovation, People and tagged learning, OECD, PISA, Trident High School. Bookmark the permalink. Muchas muchas gracias por este sitio tan maravilloso, ahora mismo lo posteo en mi twenti. gracias.he puesto en mi blog un link a tu web. Mi blog tiene un PR de 2.saludetes!